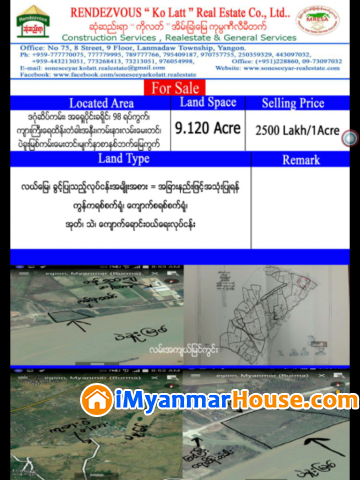 ေငြေဆာင္လမ္းမေမးတင္,(SL23-001358) For Sale Land in Pathein Township. Maggin Street,(SL15-001346) For Sale Land in Yankin Tsp. Near Su Poung Bus-stop , (SL 2-001230) For Sale Land @ Hmawbi Tsp. Rendezvous ko latt Real Estate Com.,Ltd. No.75 , 8 street , 9 Floor , Lanmadaw Township.